Our goal in the infant room is to provide a safe, loving, and stimulating environment where infants can grow and develop at their own rate. Educational/Intellectual: Cognitive growth begins with language experiences. Caregivers stimulate infant’s interest in communication through continual verbal interaction and communication. This includes responding to babbling, talking with infants, when providing custodial care, singing songs, and providing age-appropriate toys. Infants are given opportunities to build their cognitive and critical thinking skills by safely exploring, testing, and seeking new challenges. Social: Through continual interaction with caregivers and other infants, each child learn how to adapt socially to the world around them. Caregivers teach and facilitate sharing and caring through playing, holding, feeding, touching and changing. Cultural: Infants begin to understand a world in which they are individuals separate from others during their first year. Through exposure to a variety of mediums, such as language experiences, books, pictures, and even foods, infants are encouraged to develop an awareness of differing cultures. Emotional: Through continual/daily social interaction, caregivers facilitate and encourage the development of language skills. Caregivers show an interest in and respect for all children and their individual rates of growth. Caregivers also show respect and understanding for each child’s emotions and emotional responses, and model and teach appropriate behavior and solutions to problems. Physical/Recreational: Infants are provided with space in which to grow and the freedom to move safely within that space. Safe and age-appropriate equipment is provided for active play to encourage and enhance developing large motor skills and coordination. Infants be offered a variety of play spaces, away from their cribs, to allow for growing interaction between teachers and other infants. Included are supporting chairs and infant seats, soft blankets and mattresses on the floor, swings, walkers and carriages for walks. Caregivers motivate children to develop such skills as crawling, standing and running by providing opportunities and encouragement. Nap/rest time are carried out by caregivers according to the infant’s own schedules and as requested by parents. Safety is encouraged and emphasized by caregivers. The Preschool Programs at Kids First Childcare prepares children for more formal learning by providing a series of hands-on activities. The learning environment encourages children to develop the necessary skills for success in school. Educational/Intellectual: Our teachers facilitate cognitive language development through exposure to literature, drawing and speaking in front of a group. Various mediums include books, tapes, magazines, newspapers and songs; and encourage the use of spoken and written language. The children are also taught how to communicate through sign language. Various art forms are incorporated into weekly themes to provide creative outlets for all children, and to introduce such pre-academic concepts as shapes, colors, numbers, letters, etc. Learning centers are provided to allow children to make choices about what they wish to pursue and explore. Teachers encourage and model the proper use of language and provide opportunities for self-expression and success. Social: Through daily interaction with teachers and peers, children learn how to adapt socially to the world around them. Teachers encourage sharing with others and also provide opportunities for independent play. By modeling and encouraging appropriate behavior, teachers help children learn to use language to solve problems, resolve conflicts and express their feelings. Teachers reinforce positive behaviors and offer opportunities for each child to be successful. Teachers provide small group activities to allow and encourage children to interact with other children in a constructive manner. Cultural: The development of a sense of cultural awareness and appreciation for diversity be facilitated and taught through mediums such as books, magazines, music, newspapers, etc. Older preschoolers take field trips to allow children to learn about their diverse community. Weekly themes provide opportunities for children to learn about different customs and holidays. Language experiences and special visitors help children to learn and adapt to the changing world around them. Emotional: Daily social interaction provide opportunities for preschoolers to develop their language and social skills. Teachers model appropriate responses and outlets for various emotions, while teaching that all emotions are “okay.” Teachers show an interest in and respect for each child. Each preschooler’s individual rate of growth be respected, and teachers provide opportunities for each child to express his or her uniqueness within the group. Physical/Recreational: Opportunities are provided for active indoor and outdoor play, as well as dramatic play. Age-appropriate play equipment are used for the development of large motor skills and coordination. Activities are also be provided to aid in the development of fine motor skills. Nap/rest time are provided daily. Teachers model and emphasize safety so children learn the importance of safe play. 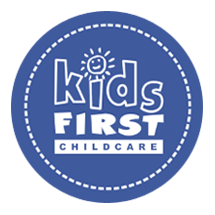 Kids First Childcare offers a kindergarten wrap program that is taught by a certified teacher(s) and a curriculum aligned to what is covered within the Brighton and Webster school district. Our program provides a solid foundation for the mastery of primary grade reading, writing, math, science, and art skills. Our curriculum includes writing (ideas, word choice, sentence fluency, organization, conventions, presentations), reading (phonemic awareness, word recognition, comprehension strategies, vocabulary), speaking, listening, mathematics (reasoning, number and numeration, operations, measurement), art/music, health/PE, social studies, and science. Our school age program and staff provide a caring, learning environment in which school age children are nurtured and motivated to develop their skills. They are respected as a unique group, taking into account their experiences at school and their age. Educational/Intellectual: Our teachers facilitate cognitive language development through exposure to literature, drawing and speaking in front of a group. Various mediums include books, tapes, magazines, newspapers and songs. Children are encouraged to use spoken and written language. The use of sign language is also encouraged. Activities and/or learning centers be provided as opportunities for hands-on learning. Centers may include Reading, Writing, Listening, Science, Social Studies, Arts/Crafts and Math. Activities are developed to enrich and augment what the children are learning at school. Children are provided with time and space, as well as assistance to do their homework. Social: Through daily interaction with teachers and peers, children continue to learn how to adapt socially to the world around them. Teachers encourage cooperative, group play but also provide opportunities for independent play. Teachers show an interest in and respect for all children. By modeling and encouraging appropriate behavior, teachers help children master language as a means of solving problems, resolving conflicts and expressing emotions. Cultural: The development of a sense of cultural awareness and appreciation for diversity be facilitated and taught through mediums such as books, magazines, music, newspapers, etc. Classroom themes provide opportunities for children learn about different customs and holidays. Teachers encourage the children to develop a sense of cultural awareness and their role in their community and world. Physical/Recreational: Opportunities are provided for active indoor and outdoor play, using safe, age-appropriate equipment to develop large motor skills and coordination. Safety is taught and emphasized by teachers to be learned by all children.